Accessories you didn’t know you needed for the 2018-2019 season! You’re probably already planning your 2018-2019 season cheerleading training wear, designing your new uniforms and sourcing the most ‘on trend’ cheerleading accessory must haves. That’s why here at PINKfudge we’ve made sure we’ve got the most fashionable cheerleading accessories to offer for this up and coming season, so you can source all of our favourites in one place. One of our favourite accessories this season is our NEW personalised cheerleading tote bag. This season’s must have is THE perfect cheerleading accessory for EVERY occasion. Whether you take it to school, use it as an overnight bag or take it to every competition, it serves well for cheerleaders, parents and even coaches. Adding this season’s must have accessory to your wardrobe not only accents your team spirit but it showcases your cheerleading lifestyle and makes your cheer experience just that more enjoyable! Our PINKfudge.com personalised squad bags are available from the end of August 2018. 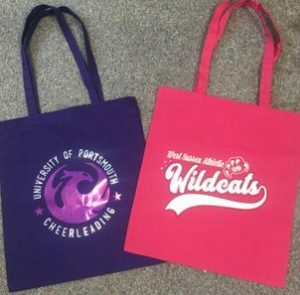 These bags make great cheer gifts for friends, family and of course team mates, and if that’s not enough to convince you… they start at just £7.99 per bag! If you want to find out how you can get your hands on a personalised squad tote bag, contact a member of our PINNKfudge team at sales@pinkfudge.com. That’s right, we went there, and just in time for the Autumn/Winter months! If you’re wanting to create a buzz around your squad at competition, what better way to do it than with one of our PINKfudge.com personalised squad umbrellas! 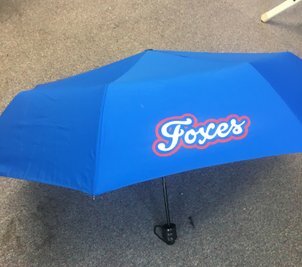 These ‘basic’ umbrellas are just the start, but if you can’t wait for the rest of our product line, pick yourself up a squad umbrella by emailing us at sales@pinkfudge.com. All umbrellas start at just £12!